In the late 1800s, riverboat travelersalong the Minnesota River would stop in a small hamlet known as West Newton, home to a hotel, sawmill, brewery, livery and general store. Today, all that remains of West Newton is the Harkin Store, the general store that seems to have been frozen in time along County Rd. 21 just outside New Ulm. Stored on the shelves are fabrics, storage vessels, chinaware, cooking utensils and medicines. As much as 40% of the inventory is original! 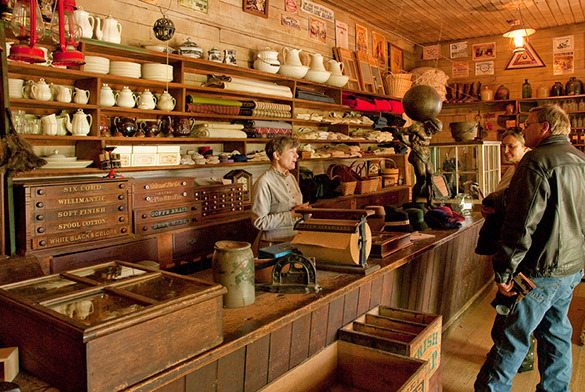 The store operated from 1870 until 1901, when its post office function was usurped by Rural Free Delivery to the area farmers. Costumed guides host programs most summer Sundays, and you can still sit on the front porch and look out at the rolling river. It is owned by the Minnesota Historical Society, an indication of its historical value and importance. Tour Hours: May 4 - Sept 3, 2018: Fri, Sat, & Sun 10am - 4pm. Sept 4 - Oct 21, 2018: Sat & Sun Noon - 4pm. Admission: $6 adults, $5 seniors (65+), active military w/ID, students w/ID, $4 children ages 5-17, Free children age 4 & under, MNHS members.